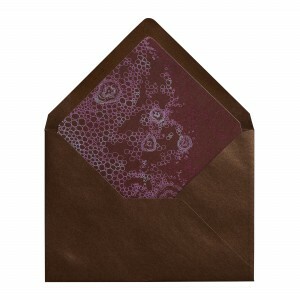 Featuring fanciful and mysterious imagery, the Dakota Invitation Envelope with Liner is modern and sophisticated. The asymmetrical pattern pops against the dark background and ties together the ombré coloration of the speckles on the other pieces. The liner is flat printed single-sided on text weight stock with a subtle eggshell textured finish. The envelope has a metallic sheen finish. The envelope liners are hand assembled in our New York City studio. $698 for 100 flat printed Liners with matching metallic colored Envelopes.